Ultimately, GROWS is not prescriptive; at the higher levels, you will discover for yourself what works, and what does not. But in the beginning, you, your team and leaders need more concrete, direct steps to take. You will take small steps (Small Bites Always) and not try and change everything, all at once, overnight. You will start with a pilot program. But in the spirit of Tracer Bullet Development your pilot will be small, but will go from end to end: from executive/leadership roles through the development team and on to select users, product owners, and other stakeholders. Begin with Agree to Try. Although everyone in the organization will not be involved at first, you need to get agreement from the participants who will be involved in and affected by your pilot. Make sure you’re ready to begin, as described in this practice. As part of agreeing to try, leaders and executives must commit to establish Psychological Safety. If team members don’t feel safe, do not proceed until they do. We recommend using anonymous surveys as a first step in evaluating team’s perceptions. Use Answers from Experiments as the fundamental engine to introduce new practices into your organization. Unless otherwise specified, the default duration for your first experiment is two weeks and should not be longer than two weeks. Start with the practices in Stage 1: Safety & Hygiene. If you are already using a practice, make sure that you’re getting the feedback and results as expected and defined by the practice before proceeding. If not, start over. Create a big, visible chart showing the state of your GROWS initiative. Whichever chart format you choose, if it takes you longer than two hours to create it, you are doing it wrong. If that happens, simplify it, scale it back, and promise to improve it later. Note that these are just the beginning steps. You’ll be doing things differently in six months. 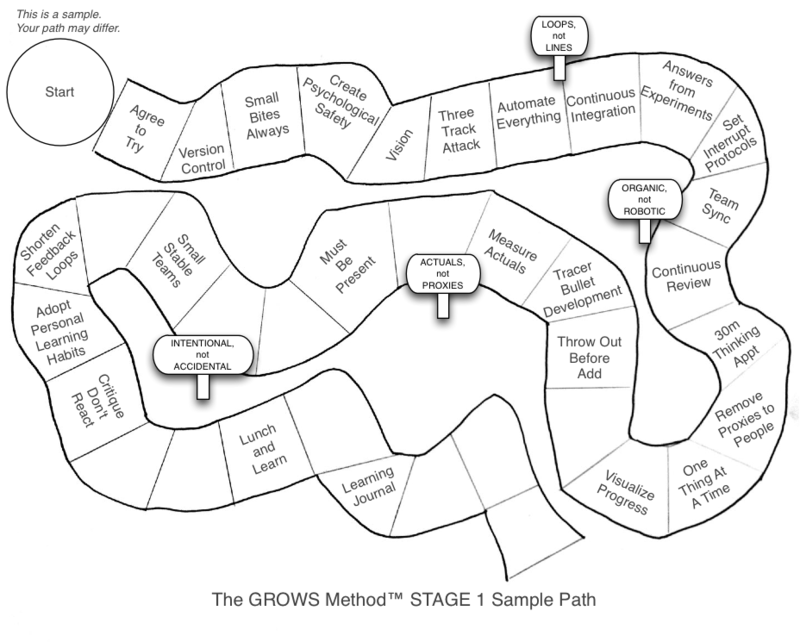 If you’re not—if you are still applying the GROWS method in the same way after six months—then you are doing it wrong. You’re not growing. You need to keep improving your methods.